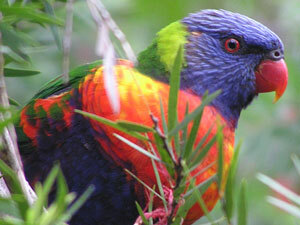 The Rainbow Lorikeet, as its name implies, has all the colours of the rainbow. 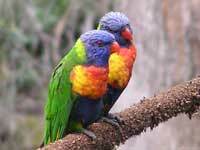 When in groups, they enter into incessant chattering and fluttering about - creating an excited partying atmosphere. 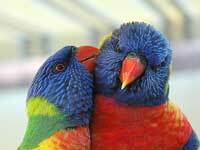 Its young can be heard uttering a single piping call for attention - especially those that are still learning to fly. 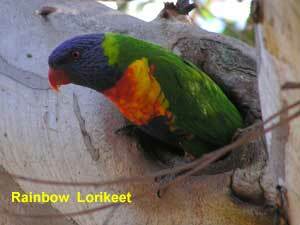 This image shows a Rainbow Lorikeet guarding its nest. When approached the adults in the nest, fly away hoping that any threat will follow them away from the nest. 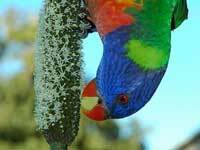 The juvenile Rainbow Lorikeet (not shown) has a brown bill. 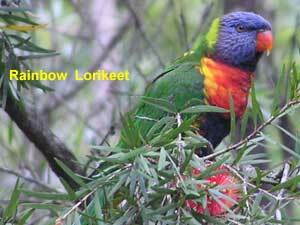 The Rainbow Lorikeet can be found in the eastern Australian coastal ranges from Cape York to Adelaide. 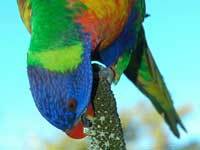 The photos above were taken in Cheltenham and the Lane Cove National Park in Sydney. Here's a great set of images taken by Martin Kandilas near Cronulla in Sydney.